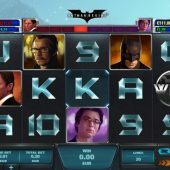 Batman Begins slot is yet another creation from Playtech and their Ash Gaming development studio to gain maximum usage of their DC Comics license which now has numerous titles including Batman and Catwoman Cash, Superman The Movie and Superman 2. Here we have a dramatic classical soundtrack as we view the snowy mountain hideaway of his nemesis from The League of Shadows behind the reels and play to some slashing sound effects. Is Batman going to win the battle between good and evil, or more importantly can you win the battle of profit over loss for your bankroll? Batman Begins is very different from what you might expect from a licensed theme game from this developer. Yes, we have 20 lines over 5 reels of 3 rows each and single icons so nothing unusual there, but a hint of what's to come (or not in this case!) is the lack of any scatters on the reels. You get some decent animated graphics and Wilds on all reels which presumably pay the top pay of Batman himself for a 5-of-a-kind win, in this case 50x your 20-coin bet. The other picture icons pay 35x, 25x, 15x, 12x and 8x respectively with the six card values offering 70 coins down to 20 for a full line, but this game is solely about the Wilds! Above the reels you'll see 2 characters separated by a meter of 8 blocks. Look on the reels and you'll see a window in the centre position and every time the corresponding character lands inside it, one block is added to their meter. You start in the Temple and here we have a Blue Wild which can appear anywhere randomly and will expand (if allowed fully to) into an 'X' shape of 5 Wilds. In this mode you'll either unlock either Wayne Manor or the Batcave locale. Wayne Manor - Wild will be orange and called a 'Petrol Wild' and engulfs the reels turning each symbol in its path into another Wild. Batcave - a Shifting Batmobile Wild is active and it will move left triggering a re-spin until it drops off of the first reel. Arkham Asylum - when unlocked from one of the two previous locales, this is a green 'Bat Signal' Wild and wherever it appears it may turn other symbols randomly Wild and award a 2-50x multiplier to any wins. Monorail. If you didn't get to Arkham Asylum from either Batcave or Wayne's Manor then you would have landed up here. This yellow 'Microwave Wild' chooses the highest adjoining symbol and then transforms other random positions into the same one.